Access some great offers and features that'll make managing your insurance easier. Our free app has plenty of handy features that'll make managing your insurance easier. Set your preferences to receive your insurance documents by email or post*. To access the offers, you'll be asked to verify you're an AMI customer by entering your details. 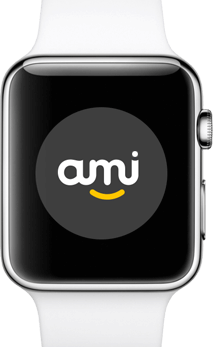 You can now view your favourite offers on your wrist, through the brand new AMI Apple Watch app. Discover and choose offers to redeem while you're on the go. How can I redeem the offers in the app? To be able to redeem the offers inside the app you need to create an online account and log into your app. If you already have an online account, before you redeem the offer you'll be prompted to login. To find out how you can create an online account, check out the instructions here. I don't have a smart phone; can I still get the offers? Sorry, the offers are only available through our app to customers who login to their online account. I've already redeemed an offer, can I redeem again? There are different availability rules for each offer. To see if you can redeem a certain offer more than once, check the offer's terms and conditions. If you're not sure, give us a call on 0800 100 200 or email us. I've activated the offer accidentally and won't get to the shop in time to redeem. Can I cancel the activation or redeem again if I don't get there? Once the offer has been activated, you will only have a limited time to redeem and unfortunately you can't cancel the activation. To see if you can redeem an offer more than once, check the offer's terms and conditions. Will other offers be added? Offers are updated regularly so keep an eye on the app to see what new offers are available. Are the offers available at all of your partners' outlets? No, our partners determine what they offer and where they offer them. Each offer is attached to a specific store/location, therefore it's important that you check and redeem the offer for the correct store.